$37,555 x 96 Months @ 4.29% APR (estimated financing rate, cost of borrowing $7,664). $0 down payment. Taxes included. Spray on Floor Liner, Heated Power Folding Side Mirrors, Cargo Partition! 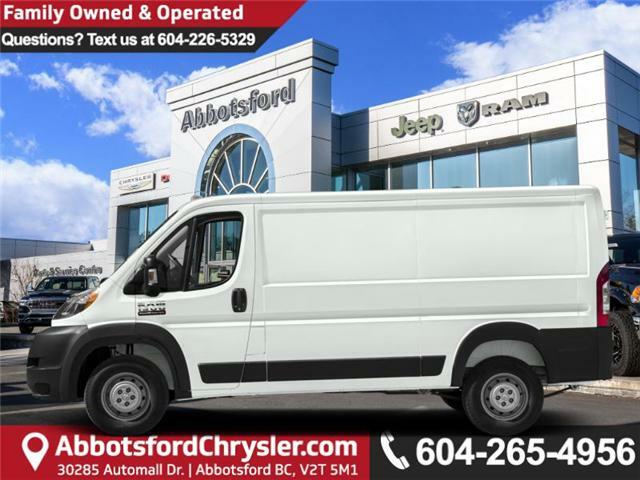 With a low load floor, great forward visibility, and class-exclusive front-wheel drive, this Ram ProMaster has an edge over competing vans. This bright white clear coat van has a 6 speed auto transmission and is powered by a 280HP 3.6L V6 Cylinder Engine. Our ProMaster's trim level is 1500 Low Roof 136" WB. This full-size van comes packed with work-ready features inside and out. Features include air conditioning, power door locks with remote keyless entry, power windows, and AM/FM/MP3 radio with four speakers, a remote USB port for charging your devices, tire pressure monitoring, electronic stability control, trailer sway control, electronic roll mitigation, and more. This vehicle has been upgraded with the following features: Spray On Floor Liner, Heated Power Folding Side Mirrors, Cargo Partition. View the original window sticker for this vehicle with this url http://www.chrysler.com/hostd/windowsticker/getWindowStickerPdf.do?vin=3C6TRVAG0JE160102. Total rebate of $3000 is reflected in the price. Credit includes $3000 Stackable Consumer Cash Discount. 4.29% financing for 96 months. Buy this vehicle now for the lowest bi-weekly payment of $239.07 with $0 down for 96 months @ 4.29% APR O.A.C. ( taxes included, Plus applicable fees ). Incentives expire 2019-04-30. See dealer for details. * Every reasonable effort is made to ensure the accuracy of the information listed above. Vehicle pricing, incentives, options (including standard equipment), and technical specifications listed is for the 2018 RAM ProMaster 1500 Low Roof may not match the exact vehicle displayed. Please confirm with a sales representative the accuracy of this information.